Rick Perry wants to lure businesses from California to Texas. Jerry Brown wants to keep them in California. It's an entertaining partisan and cultural battle, but with substance at its core. What could be more fun than a throwdown between Governor Goodhair and Governor Moonbeam? Rick Perry is on a four-day “business recruitment trip” to California, escalating his raids on Jerry Brown’s economy and getting enough attention to, maybe, get some businesses to think about moving. After new taxes that were imposed by California and Congress at the end of 2012, Californians — including decision-making executives — are among those who pay the highest taxes in the country. Perry spent a pittance — $24,000 for a radio ad in a state like California has a smaller audience than a tweet from Paris Hilton — to tweak Brown’s nose on jobs. In the recent ad, Perry talks about how hard it is to do business in California and how easy it is in Texas, suggesting the job-makers on the West Coast would have a better time if they would simply move here. It is a lovely thing when two political avatars slug it out in public. The little radio advertisement has so far become a weeklong conversation about the relative virtues of the nation’s two biggest states. In other words, Perry got just what he wanted. The first part of persuading someone to move is getting them to consider that idea. Behind the ads and the commentary is a serious competition between the states for economic pre-eminence. In that corner, Athens. In this one, Sparta. Each serves as the other’s foil, the Ali to its Frazier, the Moriarty to its Holmes, the red to its blue. Each sees itself as the economic, cultural and political engine of the future. Over the past decade, Texas has been knocking the feathers out of the competition, adding jobs faster than any other state. That’s one of Perry’s brags and would have been a centerpiece of his 2012 presidential campaign, had he kept that effort alive long enough to need a centerpiece. Not from Texas? Here’s one argument heard lately in California: Perry and Texas didn’t create all those jobs. They stole them. When Countrywide Financial (may it rest in peace) moved from California to Texas in 2004, Texas threw $20 million at the company, which in turn promised 7,500 jobs. Even the rosiest spin on that deal failed to add to the number of jobs in the universe. It just relocated them. You can put all of the eggs under one chicken, but that does not make that chicken the best egg-layer in the coop. On the other hand, it does make that chicken the one with the most eggs. The governor versus governor and state versus state competition is a king of the hill thing, with winners and losers. For a national candidate, it is a harder sale to make, because a president gets blame or credit for the overall picture and not just for health in one precinct of the country. Both governors have been national candidates; Perry hasn’t ruled out being a national candidate again. Maybe he just wants to make friends. If you had both states in the bag, you’d be the next president. It would be highly unlikely that a candidate could take Texas and California and lose. But at the moment, it’s highly unlikely that anyone could get them into the same camp. New friends or not, Perry would find the same stiff political headwind in California that Democrats face in Texas. Texas’ low taxes and regulations are in there, too — that’s Perry’s stock in trade. “We led the nation out of recession and into recovery, and remain the nation’s prime destination for employers and job-seekers alike,” he told lawmakers last month. The Californian is good at this economic development thing, too. The state’s finances are getting better, and the economy there is improving more quickly than the national average. And he has a different audience, too. Texans might be rooting for Perry’s marauding out West. 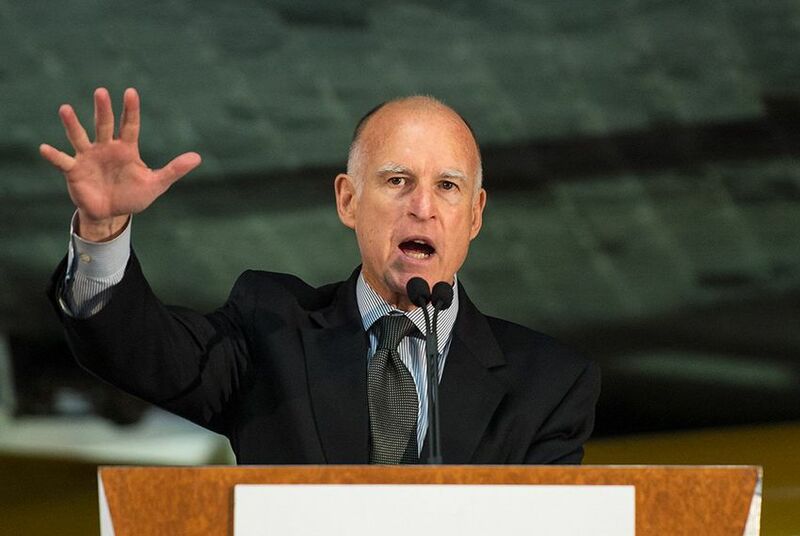 Californians have to be cheering Brown’s unwelcoming response.